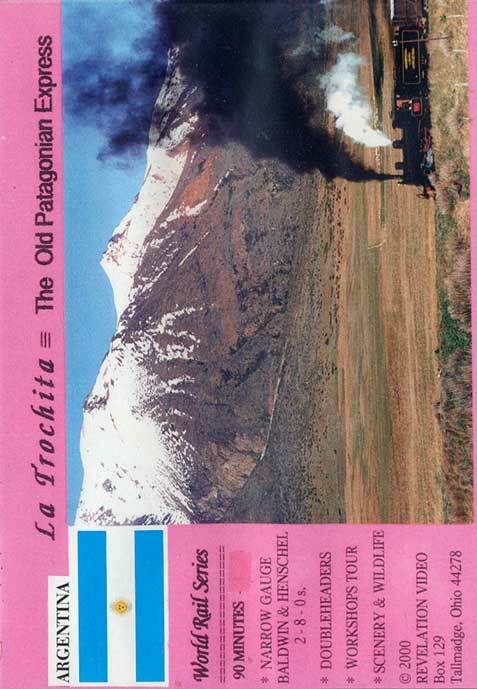 TROCHITA " means NARROW GAUGE 2', 5-1/2" !! and there's 402 Kilometers of it stretching through the vast Patagonia of southern Argentina. 1922 vintage Baldwin and Henschel 2-8-0s alternately labor up the 4% grades, then lunge along the straightaways with a mighty roar out of all proportion to their size. October 2000 digital video is combined with scenes from previous years in order to show the entire route from Jacobacci to Esquel (where Butch Cassidy and the Sundance Kid once "visited"). Cab rides, speed, the panoramic Andes - even an armadillo chase! A world - class adventure ! !